IIST offers two certification programs that are based on well-defined Bodies of Knowledge approved by IIST's Advisory Board. The IIST Advisory Board strongly believes that the value of any certification program lies in its ability to meet individuals' diverse needs and interests for both breadth and depth of content so that it helps them improve the way they perform their job on a day to day basis. CSTP is an education-based certification, based on a Body of Knowledge that covers areas essential for every test professional to effectively perform their job in testing projects. Based on the objectives of the CSTP Certification and in response to the demands imposed on test professionals to handle a wide range of responsibilities using different development environments and technologies, re-certification through continuous education has become necessary. This necessity has also been confirmed by CSTP graduates, who continuously inquired about a mechanism by which they can further develop skills in more advanced and specialized areas of software testing. In response to this need, the IIST Advisory Board has approved the requirements for re-certification as outlined below. 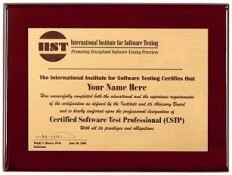 CSTP Certification will expire 3 years after it is granted. As a result, all CSTPs must complete the re-certification requirements before that time. 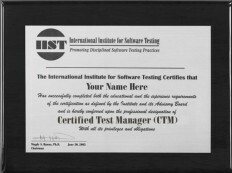 CTM is based on the Test Management Body of Knowledge (TMBOK) developed by IIST through its Advisory Board. The Certified Test Manager (CTM) certification has been created to fill this gap. - Provide professional recognition and career enhancement for those who manage test projects. Based on the objectives of the CTM Certification and in response to the demands imposed on test professionals to handle a wide range of responsibilities using different development environments and technologies, re-certification through continuous education has become necessary. This necessity has also been confirmed by CTM graduates, who continuously inquired about a mechanism by which they can further develop skills in more advanced and specialized areas of software testing. In response to this need, the IIST Advisory Board has approved the requirements for re-certification as outlined below. Requirements: CTM Certification will expire 3 years after it is granted. As a result, all CTMs must complete the re-certification requirements before that time. How do we sit for these certification exams? Where do we get the formal education for the same?